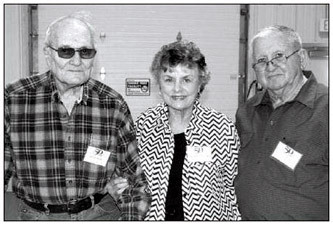 Fifty years of a vocational education school in Chillicothe was celebrated during a dinner and program at the Mervyn Jenkins Expo Center Sunday afternoon, October 1, 2017. Among the 250 people who were gathered for the event were all former directors of Chillicothe-Area Vocational Technical School (later named Grand River Technical School). Also in attendance were a few original faculty and staff members, as well as one of the school board members who helped usher in the technical school. 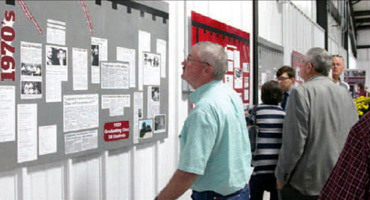 Newspaper clippings placed on display boards detail the history of Grand River Technical School. The school opened as Chillicothe-Area Technical School in 1967. Dr. Roger Barnes, Chillicothe R-2 superintendent of schools, welcomed the guests and referred to Grand River Technical School as the flagship of the Chillicothe R-2 School District. "Each day, 700 students enter Grand River Technical School, learning and mastering skills taught by the GRTS staff," Barnes stated. He noted that 60 percent of the instructors at GRTS are GRTS graduates. GRTS Director Jayme Caughron, who served as assistant director from 2004 until 2013, when she was named director, reflected on the school's history. "Fifty years ago, Chillicothe Area Vocational Technical School opened its doors," she said. "Fifty years ago, 10 instructors and a director designed training programs that would prepare students for careers and meet the needs of industry." "Fifty years ago," she continued, "this school changed our educational system; changed our community; changed lives. Today, we celebrate those 50 years and each person who has contributed to the school’s success." In 1967, there were 150 students enrolled, including 22 post-high students, 122 Chillicothe high school students, and six students from Trenton, the only sending high school. In 1973, a new addition was completed to accommodate the rapidly growing number of students. In 1995, a name change was in order to more accurately reflect the students who were attending the vo-tech, and the school became known as Grand River Technical School. In 2010, all agricultural classes were moved to the new Litton Ag Ed Center on the Litton Ag Campus which allowed for renovation of the current building so that tech programs could be expanded, shops could be enlarged, and more students could be better served. Today, GRTS hosts 730 students from 16 area high schools, as well as adults from throughout the Midwest. They are enrolled in 13 technical programs and three advanced technical programs. The school's most recent overall placement rate is 98%. Several individuals were called upon to offer comments during Sunday's program, including the three school directors who preceded Caughron. Ron Wolf, director from 1989 until 2013 told about how vocational schools came into existence through the Vocational Education Act of 1963. Missouri decided it would have 16 schools. Schools wanting to start a vo-tech school had get school board approval and apply to the state. "It was important to get your application in quick and early," Wolf said. "Out of the 500 school districts in Missouri, sixteen of them were going to get area schools." Wolf stated that opposition came from the school district's superintendent and a few school board members. A technical school would require a bond issue election, a building constructed, more teachers hired, and a larger budget. "The story I keep hearing is that Bill Gutshall and Bill Foster, who were both teachers in the district at the time, were instrumental in getting a school built," Wolf said. "Bill Foster was adamant and passionate about the need for a vo-tech school in Chillicothe to help our students and serve our community." Foster taught drafting at Chillicothe High School from 1958 until 1965, but he didn't leave Chillicothe without first putting together the application for a vocational technical school. Chillicothe was successful and was among the first 16 districts in the state to be approved for a vo-tech school. Foster stayed in education and retired in 1999 as assistant director of occupational and continuing education for Metropolitan Community College. He was among those gathered at Sunday's celebration. Although having not taught at Chillicothe Vo-Tech, Foster was complimentary of the school’s success. "I don't know of any area vocational technical school - I used to travel the state looking at all the schools - and I don't think there is any school that has shown more progress than Chillicothe," Foster said. "You are to be commended." Foster recalled contacting business people and working with community members to get support for vocational education. "I started working the square," he said. "I visit with all the business people in town and around the square. That became, I think, the first advisory committee." Ron Wolf began teaching agriculture at GRTS in 1971 and was named assistant director in 1984 and director in 1989. Of the 115 teachers at GRTS throughout the years, Wolf had worked with all but seven. He said GRTS stand out among the state's vo-tech schools. There are 12 vo-tech schools within 100 miles of Chillicothe and eight are in communities larger than Chillicothe, he said. "Every one of them has a fancier building than Grand River Tech School, and every on has more modern equipment than what we have," he said. "But, Grand River Tech School is the best one of all. There are more students here; we serve more community people here; our graduates have better placement from here. There are several reasons why GRTS is best. We have great community support, great placement by our graduates, great cooperation with our high school and area high schools. But, I always keep coming back to one big difference: It's all about the people. This staff and the success of the students are the reasons GRTS is the best." Wolf praised the original vo-tech staff for setting the standard for teaching. There were 10 people who came to this school in the first two years and stayed, Wolf said. Those nine teachers and their director (Roder Nyberg) stayed for an average of 26 years. "They all came out of industry, were very skilled, lived in this community, already had good jobs, yet they accepted the challenge to become a teacher at Grand River Tech School," Wolf said. "Most had not been to college, and they were not teachers." (but not pictured) were Vera Gibson (health occupations teacher) and Roder Nyberg (school director). Vo-tech schools are important in producing productive members of society. "Students have different abilities. Some make As, some make Bs, some make Ds, but, every student can be employable and be successful in life at some level and good teachers never give up on that student." He said he learned that concept from the original 10 teachers: Betty Barrows, Lee Fitchett, Bill Gutshall, Don Ward, and Paul Zachary, Lloyd Dent, Bob Chenoweth, Vera Gibson, Wayne Wade, and Roder Nyberg. Chenoweth, Gibson, Wade and Nyberg were in attendance at Sunday's program. "That staff in 1967 defined our purpose, established our objectives, and set an example of what a good teacher does," Wolf stated. "There has never been a reason to change." Wolf noted that the GRTS curriculum has changed drastically through the years, but its main mission will never change: Make kids better and prepare them for successful futures. "GRTS is the best investment ever made by R-2 Schools and our community," he added. Wolf introduced John Neal, who served on the Chillicothe R2 Board of Education at the time the bond issue for a vocational school was approved in 1965. Chillicothe Mayor Chuck Haney offered remarks and presented to Caughron a proclamation on behalf of the city recognizing the school's 50-year existence. Additionally, the mayor presented Caughron with a resolution offered by State Rep. Rusty Black on behalf of the Missouri House of Representatives. "The Chillicothe area vo-tech school is the envy of not only the area, but the state of Missouri," Haney said. "It's because of the staff and the people." Roger Wolf taught agriculture at GRTS from 1977 until 1989, when he was named assistant director. He served as co-director from 2004 until 2013. During Sunday's program, he reiterated the quality of the school's teachers. "They knew their subject better than anyone I ever knew in my life," he said. "If they taught a technical skill, they knew it from one end to the other." They also possessed a desire to see their students succeed. "They loved kids, and they loved to get them a job," he said. "That was important." GRTS, Wolf stated, provides an opportunity for students to graduate with employable skills and little debt. Roder Nyberg also addressed those gathered for Sunday's celebration. Nyberg was the first director of GRTS. He talked about the original 10 teachers and also recognized Johnna Sue Zachary, who was the school's first secretary. "Fifty-two years ago, we were trying to figure out a lot of things," Nyberg said. "We were working on the school, square footage, dollars, and things that needed to be done before we could move forward to a bond issue for the vo-tech to become a reality." Time was also spent educating the community about vocational education. "Most people had never heard of a vo-tech school," Nyberg said. "We needed to inform the community." Most of the support for the idea came from the business community, he recalled. A $250,000 bond issue was presented and approved and would be matched with state funds. The measure passed 5:1, with 1,021 votes in favor and 197 votes opposed. "That was the first time we could say we were going to have an area school," Nyberg said. "I hope all of you are as proud of the vo-tech school as I am." Also speaking during Sunday's program was Bob Chenoweth, who taught electronics from 1967 until 1994. "It's been a great ride," he said. I'm very proud to have been a member of the staff." He also noted former students who became instructors at GRTS. Chillicothe Fire Chief Darrell Wright also offered comments during Sunday’s program. He began teaching EMS/Paramedics in 1992 and continues to teach classes. "I didn't have a college diploma and didn't know anything about teaching when I was asked to teach," Wright stated. But, the EMS and paramedic classes have become a strong program and "have made a significant impact in north Missouri," Wright said. Representatives of several student organizations also provided comments - Claire Shipp (representing Chillicothe FFA), Will Kieffer (representing FBLA), Metaija Johnson (representing Skills USA), and Jylian Davis (representing FCCLA). Lance Martin, FFA advisor, provided the blessing for the meal; and Liberty Cox, FFA chapter vice president, led those gathered in the Pledge of Allegiance. This page updated by BK Web Works 01/14/2019.